The first rule of Galentine’s Day is you have to talk about Galentine’s Day. As in, what the heck is it, why should I participate in this made-up holiday, and what’s the real reason it’s worth conflating your best friends with what could become the next Hallmark marketing event. In actuality, it might be the best TV-joke-turned-Internet-meme-turned-holiday ever, since it forces you to go through the 14 text messages, 26 Facebook message and two personal calls it takes to get three very busy women with families and jobs to make the necessary space for each other. It’s the true reason for the season of hearts, a chance to spend hours alone with your best pals and ignore the rest of the world in favor of fine wine, finer talk and laughs galore. I’ve got some wine country tips for your best pal trip, but first, some background. “Galentine’s Day” aired as the 16th episode on the second season of the beloved television series Parks & Recreation on February 11, 2010. In the episode, Leslie Knope (Amy Poehler), explains that every February 13 she kicks it with her ladies with brunch. So it seems that Galentine’s Day should at least involve brunch and ladies. I’ll add to that wine tasting at a jaw-dropping tasting room and walking America’s best Main Street. My girls and I started our Galentine’s Day explorations in McMinnville at The Barberry, one of the newest additions to the McMinnville dining scene. The restaurant encompasses the bottom floor of the KAOS building on 3rd Street and stands as the upscale, intimate destination to the rooftop’s casual 1882 Grille. I had been before for a friend’s birthday wine pairing dinner – it’s one of the only places in town that does a 7-course wine pairing dinner. But I had never been for brunch. Mimosas come made with fresh squeezed orange juice, cocktails with top shelf liquors, and our dishes – we all ordered some variation on brunch classics like frittatas and Eggs Benedict because we make good choices – arrive in perfect order. I think E.M. Forster’s heroine Lucy Honeychurch was actually looking for Youngberg Hill in her quest for A Room with a View. The tasting room, set in an inn just minutes west of McMinnville and overlooking the 28-year-old vineyard blocks toward Mt. Jefferson and Mt. Hood might be wine country’s best. 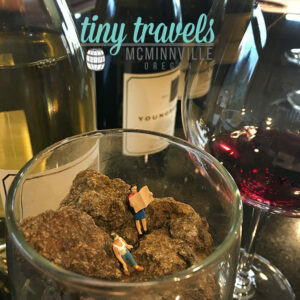 It’s also one of the more interesting microclimates in wine country, so if you can stop joking and connecting for a moment (we almost couldn’t), there is much to be savored in discovering the three vastly different soils there and how they impact the winery’s exceptional Pinot noir, Pinot blanc and Pinot gris. Back in town, we walked 3rd Street in the rain and popped in our favorite bookstore, Third Street Books, where I ended Galentine’s Day, with true irony, looking at cards. It struck me, as I walked the store with my best friends, that I knew nothing of their shopping habits because we literally had never done this together before. What’s are holidays for unless it’s to go deeper in your relationships with the ones you love? Come to think of it, forget Galentine’s Day – what about Galentine’s Weekend? I can imagine it now: Three days devoted to the pleasures of good company, maybe we’ll all stay at Third Street Flats and really spread out where we can walk and laugh and stroll as much as we want. So call me a Galentine’s Day convert. You won’t hear me say anything snarky about Galentine’s Day. Instead, you’ll probably see February 13 marked on next year’s calendar with a red Sharpied heart. Emily Grosvenor is a travel writer and essayist based in McMinnville. Follow her on Twitter @emilygrosvenor.